Two versions have been located, Brazilian and PAL. 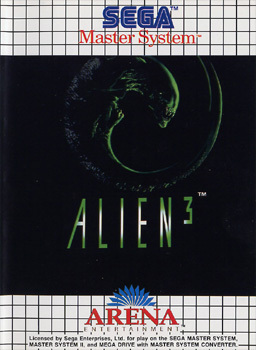 The Brazilian version has a larger front image with a close up of the alien behind the logo. 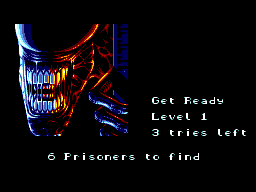 "The Xenomorph are fast, spit acid and are right behind YOU! Can't see very far ahead in these air ducts, hard to breathe, face huggers can be anywhere, must find the mother alien. The closer you get the more aliens you find... Better not have them find you first! Just keep telling yourself, "this isn't really happening... It's only a game!" "
Start game play in two player mode and obtain a high score for both players. 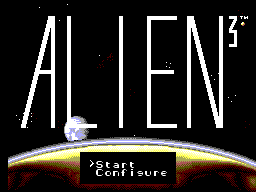 Intentionally have one of the players lose all their lives and enter ALIEN as a name on the high score screen. The corresponding player will have unlimited lives when game play continues. Enter the configuration screen. 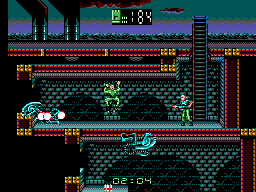 Enter two players and then start the game. Complete level one with player one and let player two die three times on the fans, now complete level 2 with player one. Player two will now start again on level one but will be graced with infinite continues.